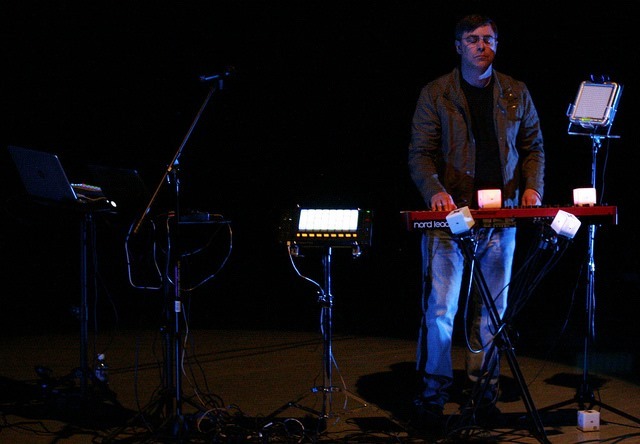 On December 23rd, 2014, Nord released an OS update for the Lead 4 Synthesizer bringing it to version 1.30. Download the update from here http://www.nordkeyboards.com/downloads/products/nord-lead-4. I applied the update to my Nord Lead 4 yesterday and got some hands-on time using the new OS. In this article I’ll offer some first impressions followed by the comprehensive list from Nord on what’s new with annotated notes. Before I talk about the update, I do want to mention that I was really hoping the Lead 4 would inherit some features from its newer little sibling the Nord Lead A1. Wait what? The little sibling has features not in the Nord Lead 4 flagship? Yes it’s true. Most synth manufactures put their latest innovations into their latest synth even if the model isn’t the most expensive instrument in their lineup. The end result is a paradox where the cheaper synth has some newer features you wished you had in the flagship model. Cases in point, the Moog Sub 37 has some features (and a newly designed oscillator) not implement on the Voyager. The Dave Smith Instruments Pro 2 features like a new sequencer that are not in the Prophet 12 flagship. [Update 2019-02-02] Another example would be the Elektron Model:Samples adding tempo multiplier per-part and Chance per-pattern where is the more expensive boxes don’t have these features yet. In the case of the Nord Lead, the newer A1 is cheaper but has some features that would be nice to have in the Lead 4. So how does this relate to this update? In a YouTube video recorded at the 2013 NAMM, a nord employee made a passing mention that perhaps they might be able to get some of the newer innovations of the A1 Into the Nord Lead 4. Well, I’m happy to report that SOME A1 features did in fact make it to the Lead 4. More on this below. So Why the Lead 4 Over the Newer A1? The afore mentioned paradox does make it a bit confusing for consumers to figure out which synth is better for them. I know plenty of people who could have bought a Prophet 12 but opted for the Pro 2 instead because of the newer features on the Pro 2. So it’s more complicated than flagship vs little sibling. In my case, back in January of 2014, I went with the Lead 4 over the A1 because the higher-end Lead 4 offers more parametric control over the synth engine and surfaces more control with more dedicated knobs. For example you get two ADRSs + a Mod envelope whereas the A1 has one 3 stage envelope plus a Mod Env. 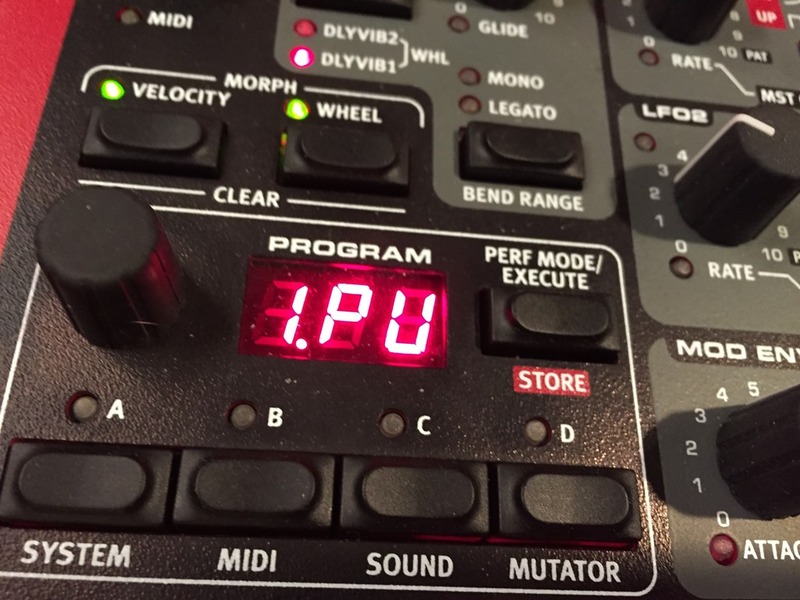 Also you get the 3 impulse morph buttons on the Lead 4 which I use ALL the time now and could not live without. 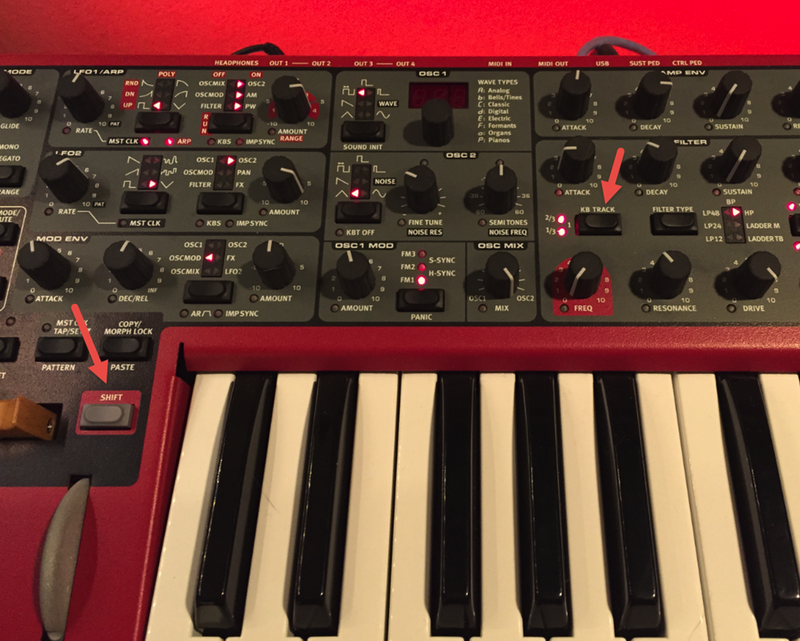 The other major difference is the Mod Envelope is WAY more sophisticated on the Nord Lead 4 in that it has more modulate targets, can be set to Attack-Decay or Attack-Release – and most important – you can trigger the Mod Envelope with a morph button. Here is a handy comparison chart BTW http://www.nordkeyboards.com/products/nord-lead-a1/comparison-chart. Why might you go for the A1? If you think you’ll mostly be tweaking factory presets, not creating signature piles of sounds or wanting more granular parameter control and you won’t miss the morph switches, the A1 is worth considering as it is less money and sounds very similar. Before we start with what’s new, let’s start with what is NOT in the update. After seeing that 2013 NAMM video I had fantasized that they might be able to add the A1’s Extended Analog Waveforms with Folding/Clipping, and Additional Digital Waveform models. It would be nice to have added some A1 effects to the Nord Lead 4 but they did not make it over nor did the ability to run delay and reverb at the same time. Again, I understand the knobs are not laid out for the the parallel effects, but I would have love to seen the Ring Modulation & Chorus jammed into the FX section with some sort of a shift feature. I’ve mocked it up below using same approach as was used on the filter selector. The Nord Lead 4 does not have endless encoders and the position of the knob does not reflect the digital value for the parameter in question after you switch presets or slots. In other words, if you turn the knob after making a switch, you could hear an abrupt jump in the timber. I’ve learned to plan around this as I maneuver. It would be so much better to have a “value scaling” pickup mode. A lot of people have requested this in the forums – but alas – no love for this idea in v1.30. Tip – you can peek at the value of a parameter without changing which is a workaround. Press and hold the “Copy / Morph Lock” key and turn any knob and you’ll see it’s value. In the photo above you can see that OSC 1 MOD amount is 2.9. 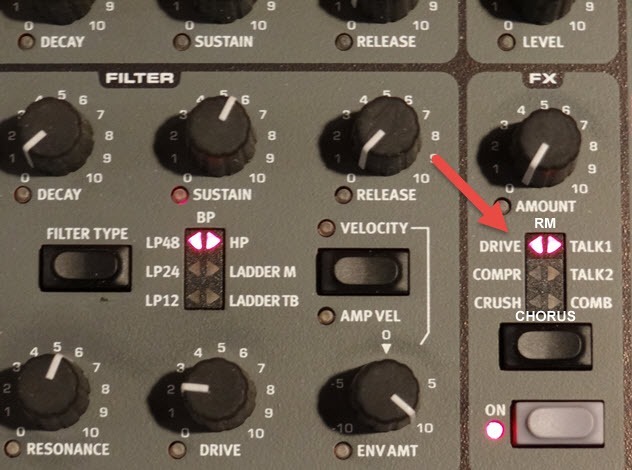 You can then set the knob near this position then release the “Copy / Morph Lock” key and turn the knob to avoiding an abrupt jump in parameter value. Multi Focus feature: When in Multi Focus mode is activated all parameter changes will affect all enable slots. To enable Mulit Focus mode press SHIFT+KBD tracking. Simultaneously flashing Slot LED indicate that Multi Focus is enabled. Slot handling now works like the Lead A1 – other slots can now be toggled on/off while pressing an enabled slot button, and tap another button to toggle it. Solo mode: Double click on a slot button to enter Solo mode, with a proper mute function. Leave Solo mode by pressing any slot button. When switching between Program and Performance mode, if Copy is held simultaneously the slot buffers are copied into the destination mode, like on the A1. Global Octave Shift is now stored in performances. Below is a list of what’s new from the Nord Lead 4 Update History page. The documentation is pretty clear but I’ve added some annotations in blue to either further explain the change or differentiate the behavior from the previous OS. The slot handling in the Lead 4 now works as in the Nord Lead A1. Nothing has been taken away but new functionality has been added. In the previous OS you could use the slot buttons to select and layer sounds. If you held a slot down and pressed other slots they would layer up. If you then pressed a single slot, that slot would be in focus. However, sustaining sounds in the other slots will still sound (ex slot 2 is in focus, slot hs “hold” button on and is droning). While this is actually a really great behavior there are times when you might want to just solo the slot in focus. You now have that as an option. Simply double-click on a slot to solo it. The other slots quickly fade out. The first two bullets in this list describe the new behavior. The slot handling now works like in Lead A1. It should feel the same, but other slots can now be toggled on/off while pressing an enabled slot button, then tap an other button to toggle it. Double click on a slot button now enters Solo Mode, with a proper mute function. Leave Solo Mode by pressing any slot button. Prior to this release double click disabled all slots except the one clicked. When switching between patch and performance mode, if Copy is held simultaneously, the slot buffers are copied into the destination mode, just like in A1. The display will show “–” to indicate that the buffers are not from any location in memory. Storing works like in A1 now, preview does not activate when storing to the same program/performance or when just changing performance mode. “Sto” is now printed after store. Storing to the same program/performance does not silence notes anymore. Fixed bug where the slot focus hint could get stuck in performance mode if fiddling with menus and exiting with shift. Fixed bug where exiting a store operation in performance mode would reload the current performance to memory, discarding any changes made since that performance was loaded from memory. Multi Focus Edit can now be toggled On/Off like in A1. When in Multi Focus mode all params, not only knobs can be set on the enabled slots. To enable Multi Focus mode press SHIFT+KBD tracking. Simultaneous flashing slot LEDs indicate that Multi Focus is enabled. Multi-Focus Edit it relates to cases where you want to modify parameters across slots simultaneously. For example, let’s say you want to turn up the filter in slots 1 & 2. In the previous OS this was called “Shift and turn” (p.10 in the old manual). You would hold the shift knob and turn the knob in question would change the value for that parameter. You can still use this method, but the new “Multi Focus” mode allows you to toggle this behavior freeing up both hands for tweaking which is really fantastic! Added MIDI Interface Broadcast mode (menu option “PU”). With option “PU” everything is sent to both interfaces. In the previous OS you had to choose whether MIDI went out over the MIDI port OR the USB port. This drove me nuts. This new “PU” mode addresses this. Fixed MIDI Bank/Program Change issue regarding what bank to use after turning dial etc. MIDI Soft Thru Program Change bug-fix. Global MIDI channel shadowing slot channels. If global channel is the same as a slot channel, only the global channel should get the message. I don’t have two Nord Lead 4’s so I can’t A/B these features. What I can say is that the signature presets I’ve created to date sound the same to me on a casual listen (your mileage may vary). I did see a comment on the Nord forum where someone mentioned they thought the reverb sounded even better. To me the NL4 sounded great before and it still sounds great. If anything there might be less artifacts when doing radical morphs – but then again, in the presets I was making there were almost no artifacts to start with. My guess is these changes are about bringing the common elements in the Lead 4 and A1 to parity. Fixed a bug where going from LFO smooth random wave to S/H didn’t update playing voices. Fixed a bug where LFO in S/H and master clock set at 64 generated noise. Improved wavetable sync and FM. New Reverb (optimized like in A1). Adjusted Ladder M feedback at zero resonance. Now that I read this I can’t remember what the old behavior was. I use to adjust the arp by ear. When synced to master clock the display for the rate parameter now shows as a division (ex 16, 16t). That might be new. Fixed chord bugs (didn’t work properly with Split, nor with MIDI). Split Point inspection without exit. Master Clock Sync vs MIDI/KbdSplit now working as expected. Global octave shift contribution removed when disabled instead of stacked with the slot octave shift. Better keyboard velocity scaling (same as for A1). 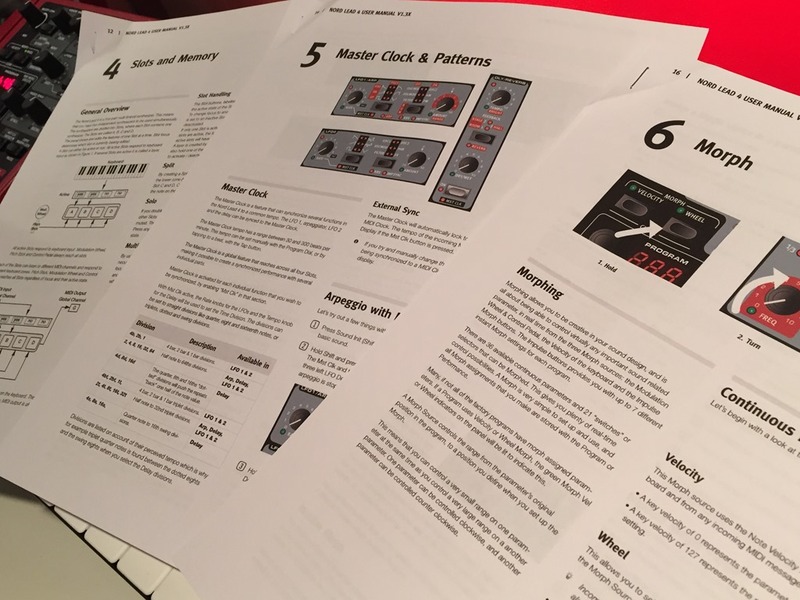 In addition to the firmware updates, Nord made some major revisions to the manual which you can download as a .PDF from http://www.nordkeyboards.com/downloads/products/nord-lead-4. In a nutshell they changed the documentation to reflect the new features. They also reorganized the manual a bit and added new content to better explain certain features such as slot management. They called out Master Clock and Patterns content into their own chapter and split Morph and Mutator into separate chapters. The chapter number is off from chapter 3 on. Since reprinting will only be 28 pages double-sided I’m just going to re-print it. The only remaining MUST HAVE on my wish list is knob pickup mode. Please Nord can you add this? Pretty please? Pretty please with sugar on top (insert photo of cute dog begging for food)? Something similar to Ableton Live’s “value scaling” knob takeover mode would be just fantastic. This option ensures smooth value transitions by comparing the physical control’s value to the destination parameter’s value and calculates a smooth convergence of the two as the control is moved. As soon as they are equal, the destination value tracks the control’s value 1:1. If you are a Nord Lead 4 user, and you would love to see this features please write a note to Nord support. Safety in numbers my friends. Did I get everything I hoped for? No. Did it improve what I had plus add some cool new features? Indeed it did. Ultimately this update is about bringing the Lead 4 and Lead A1 instruments and documentation to parity where there was clear overlap in the control surface. I used the hell out of the Nord Lead 4 in 2014 and have no regrets. I fell in love with it right away. It sounds fantastic to me, has a great features set for live performance – and weighing in at only 12lbs (26lbs in the iSeries SKB Flight Case) it’s great to travel with. So much so, I decided to also make it my primary keyboard controller for my Ableton Live rig for all my solo sets in 2014 including away festivals that required airplane travel (photos). The new update makes my beloved Nord Lead 4 even better – especially the new slot solo mode. [update 2019-02-02] I’ve added some video of the the Nord Lead 4 in action since I wrote this article.